An effort is underway in Benton Harbor to crack down on the illegal dumping of trash. The Benton Harbor Department of Public Safety tells us discarded tires, mattresses, and other junk have become a major problem. Word went out Thursday about a new tip line that has been set up for people to report the practice. Police say the situation has gotten so bad the city has spent more than $169,000 on extra dumpsters to remove the illegally dumped material over the past three years. The Benton Harbor Department of Public Safety has made four arrests as part of its illegal dumping investigation since last week. The Michigan Department of Environmental Quality is also assisting. 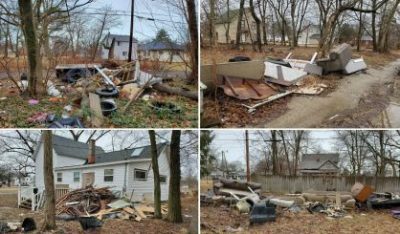 To report the illegal dumping of trash in Benton Harbor, call or text 269-944-7929.